"When you need a dessert fast for those forgotten dinner parties, this is the perfect fix." In a medium sauce pan over medium heat, combine condensed milk, butterscotch chips and white chocolate chips. Stir constantly until melted and smooth. Remove from heat and stir in butter and rum flavorings. Pour into a 9x13 inch dish, cover and refrigerate until firm, 30 minutes. Cut and serve. Creamy fudge with a cookie crunch! It's good but a little bit too sweet. It was a total hit at Thanksgiving! Thank you!!! This is a great recipe. I didn't have any butter extract so I used French Vanilla instead. I brought the mixture to a full boil to help it set and it turned out great. I recommend it for sure. 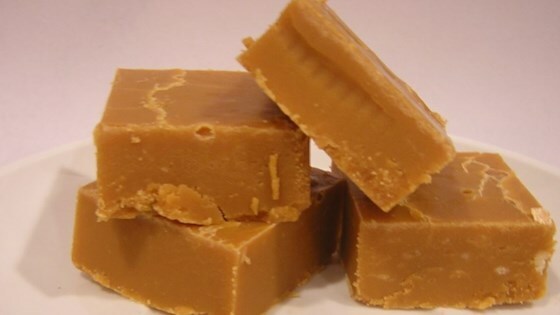 Not of fudge like consistency at all -- made with the condensed milk -- not good at all. My husband loves butterscotch but this didn't set up and it was so sweet. This was made using the milk that was previous left out of the recipe.